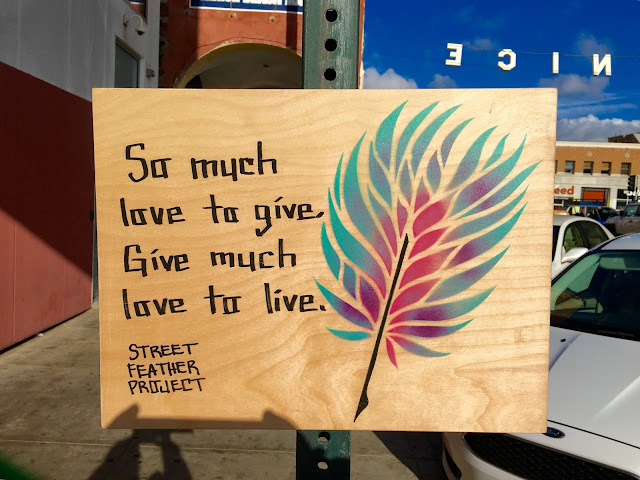 I got home and looked up "Street Feather Project" and discovered that it's an organization that puts positive, artful messages up all over the world, planting seeds of love and goodness along the way. Their credo is "Because we still believe we can change the world with our creativity. Art for all." I get it, because you can't stop and read these wonderful messages and not feel better about things in the world, knowing that there's people out there doing nice stuff like this. Making the world a little better with every message. I love it. What a great Valentine's weekend message ... "So much love to give. Give much love to live." Because that's what it's all about. LOVE.